Kevin Downs, a junior Spanish major, spends many of his days traveling between classes, student organizations and his job in his hometown, leaving about four hours for sleep each night. Between working 15 to 25 hours a week at a Rite Aid in Aston, Pa., attending classes and completing homework, sleep gets put on the back burner for Downs. “I’m really very, very tired if I’m not up doing something,” Downs said, adding that he tries to catch up on sleep during his break at work and drinks 5-hour Energy to stay awake. Downs has another problem: He’s only able to fall asleep between the hours of 3 a.m. and 4 a.m. and stays awake all night otherwise. His doctor told him to start taking Tylenol P.M. to promote a more regular sleep schedule, but Downs has not been able to set aside enough time for sleep in order to try it. The Journal of Adolescent Health found that more than 3 percent of college students are not getting the amount of sleep they need. While pulling a TECH Center all-nighter before an important exam may help you get through the multiple-choice section, studies show this type of cramming does not work for long-term learning and memory. “To get true learning, your brain has to rest,” said Dr. Frederic Jaffe, an assistant professor of medicine in the Division of Pulmonary Critical Care Medicine and Sleep Disorders Center at Temple University Hospital. The work students do when they are deprived of sleep is far worse than it would be with sufficient sleep. So although students are notorious for their late-night cramming sessions during finals season, it may do little good for how much they remember in the long run. “College students have a tendency to practice very poor sleep hygiene,” Jaffe said. With everything that goes on during the day of a college student, sleep is not a top health priority. Not to mention the newly gained freedoms of college life don’t leave room for anyone to tell you when it’s time to stop playing Super Smash Bros. and hit the hay. Jaffe said two types of sleep deprivation exist: total and partial. Total sleep deprivation is when someone is awake for 24 hours or more. Partial sleep deprivation is when someone gets less than a normal amount of sleep every night. “Sleep deprivation is a lack of sleep that is less than what an individual’s body requires,” said Dr. David Reitman, who specializes in adolescent and young adult health at George Washington University. While many college students may grow accustomed to long, busy days and late nights that only leave a few precious hours for sleep, there are many health problems associated with sleep deprivation. Studies show that a healthy amount of sleep for most people is between seven and eight hours a night, with small groups of people who need more or fewer. Broadly speaking, sleep deprivation can lead to a shorter lifespan as well as make someone more susceptible to memory problems, heart attack and cancer, Jaffe said. Sleeping is a restorative process – it is when the body heals. Reitman said headaches, abdominal pains, nausea and diarrhea can all be linked to a lack of sleep. He said sleep is also the time when the immune system fights off infections, so that cold you mysteriously can’t kick could be the result of how little sleep you’re getting. Sleep deprivation can also affect mood, cognitive ability, reflexes and ability to make decisions. “Someone who is chronically, or even acutely, sleep deprived is going to have reflexes akin to someone under the influence of alcohol,” Reitman said. Skipping out on the shuteye may also be the reason you’ve been putting on a few pounds. 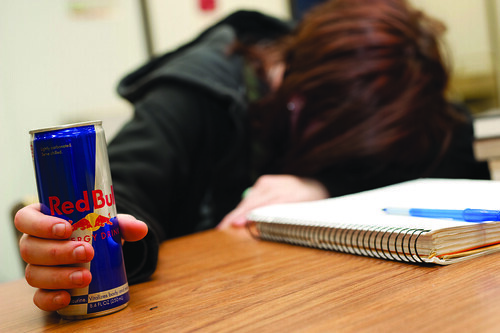 “When you are sleep-deprived, your body thinks it’s under some type of distress,” Jaffe said. In normal people, sleep deprivation leads to a change in the hormones leptin and ghrelin, which, respectively, make the body feel full after eating and stimulate the appetite. Under this perceived distress, the body produces more ghrelin and less leptin. When this happens, your body is actually fooling you. The hormonal changes cause you to eat high-carbohydrate foods even when you’re not hungry. The college lifestyle can be a toxic environment for practicing what is called “good sleep hygiene.” Someone experiencing problems with good sleep hygiene should start by setting times to go to sleep and wake up, without altering them much on weekends. If possible, the bedroom – or at least the bed – should only be used for sleeping, not studying. Jaffe recommends that one does not exercise or have caffeine or cigarettes two hours before he or she goes to bed. He also said people shouldn’t take naps during the day. And at night, if you do not fall asleep within 15 minutes, you should get out of bed and do something else, he said. Not only college students, but as a society, people do not put a high enough value on sleep, Jaffe said. He said although the hustle and bustle of balancing classes, homework, jobs and friendships can cause sleep to fall into the background, getting more of it may be the solution to some of our daily problems. “Making [sleep] a priority will improve your life,” Jaffe said.